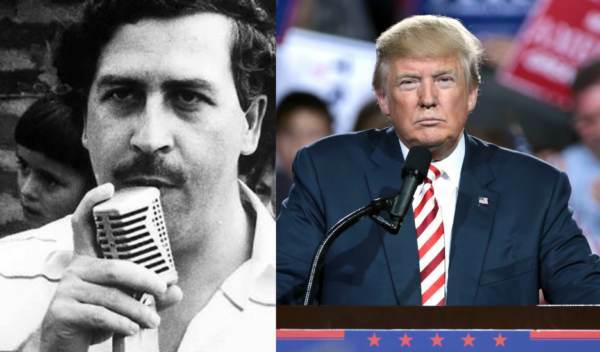 Earlier Tuesday morning, a GoFundMe effort to collect $50 million to impeach President Donald Trump was launched by Roberto Escobar, the older brother and co-founder of the legendarily violent Medellin Cartel. It’s billed as a “Legendary Latino Hero” going against DJT. In the copy for the campaign, which has since been suspended by GoFundMe pending an official review to get a better idea of where the money would actually go, Roberto Escobar claims he has information about Trump’s business dealings with his brother’s multi-billion dollar cocaine enterprise. According to TMZ, who first broke the story, the funds would go towards lawyers, lobbyists, and intelligence research that would lead to Trump’s downfall in Congress. “Roberto claims he’s already got dirt on Trump from previous alleged business dealings between DT and the Escobar company … among other things. Roberto says his dirty secrets on Trump are something Special Counsel Robert Mueller would wanna hear. Roberto’s reminder that his family has killed thousands of police, judges, lawyers, journalists and politicians during their bloody reign in Columbia is no laughing matter. Pablo Escobar famously assassinated Colombian presidential candidate Louis Carlos Galan and Minister of Justice Rodrigo Lara at the height of power for the Medellin Cartel. This is a breaking story and we will report further if GoFundMe restores the campaign or if Roberto Escobar finds alternative methods to raise coin to impeach / eliminate Donald Trump.